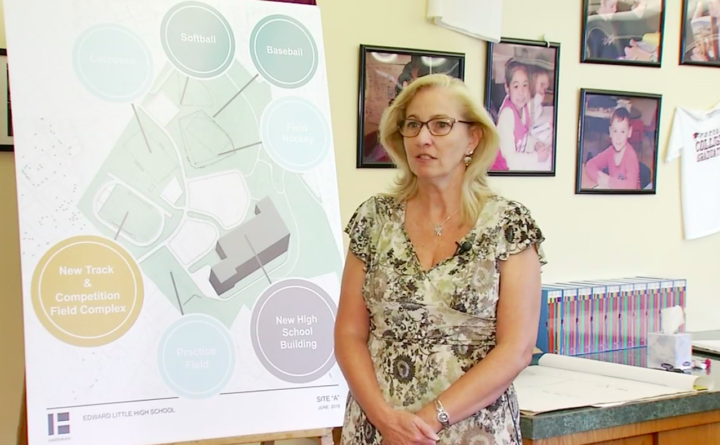 Katy Grondin, superintendent of schools in Auburn, speaks to CBS 13 about plans for a new Edward Little High School in the city. The community is showing an overwhelming amount of support to keep the new Edward Little High School in Auburn right where it is. Sixty-six out of 71 people in attendance at Wednesday night’s meeting voted “yes” to keeping the building at the current Harris Street site. The “straw poll” vote is a state requirement in order to show community support. School officials say they are looking forward to having all of the athletic fields in one place. “It was very exciting because this is getting us closer and closer. So, September 12th we go to the Maine Board of Education for their approval of the recommended site.” Auburn Superintendent Katy Grondin said. Once the site selection phase is completed, school officials will be moving to the design phase. They hope to open the school in the fall of 2023.